All week I have not known what to do, so I’ve collected food and funds, run to the store and made telephone calls. I can’t bear to think about what has happened to someone I know and am fearful of it happening to me, to my son. I don’t know how Yuhong bears the pain. James’ memorial service was today at four o’clock. My fifteen year old son Ryan and I attended. He helped me prepare food for the reception, then went to put on his good khaki pants, blue striped dress shirt and one of his brother’s ties, the yellow one with tiny blue diamonds. He knocked on my bedroom door, clothes in his hands. “Do you mind ironing the pants and shirt for me?” he asked. He’s never done that before. Usually he puts on whatever is available, wrinkled or not and argues with me about having to take it off again because it’s not presentable. We loaded the car and arrived at the high school early. Several friends met us at the front and we carried in the food purchased with donations from people at the nursing home where Yuhong and I work. Ryan opened packages, arranged food on silver and crystal platters and didn’t seem to notice that he was the only teenage boy amongst the women and girls helping set up. At four o’clock we gathered with others at the auditorium door, signed our sentiments in the guest book, took the program for the service and filed to our seats. The huge room was filled with students, teachers, members of the community and friends. Photographs of James came into focus and faded away as they changed in a slide show on the screen on stage, a smiling kindergartener with ABC’s taped across the blackboard behind him, a sixth grader on his first day of middle school, a nervous smile on his face, an excited boy with his father in a stream, holding a just-caught fish, a teenager with bangs swept to the side and a determined look as he perfected a trick on his skateboard, a serious musician strumming a guitar. Fifteen years of James’ life. A minister lead us in prayer, someone read a poem, teachers spoke of a young man’s commitment to school, kindness to others, sense of humor, his smile, and how he honored those who knew him. James’ two best friends presented a power point slide show of their favorite pictures of James as the Beatles sang Strawberry Fields Forever in the background. The last photograph was of a laughing James with the words: Rest in Peace Friend. Ryan and I didn’t stay for refreshments. We couldn’t eat. We walked to the car in silence and didn’t say much on the way home. After we pulled into the driveway, Ryan went to the garage to see how his Dad was coming along on the boat repairs. I walked to the backyard toward the garden, not wanting to go into the house, but not knowing what else to do. As I stopped at the garden gate something pink caught my eye. 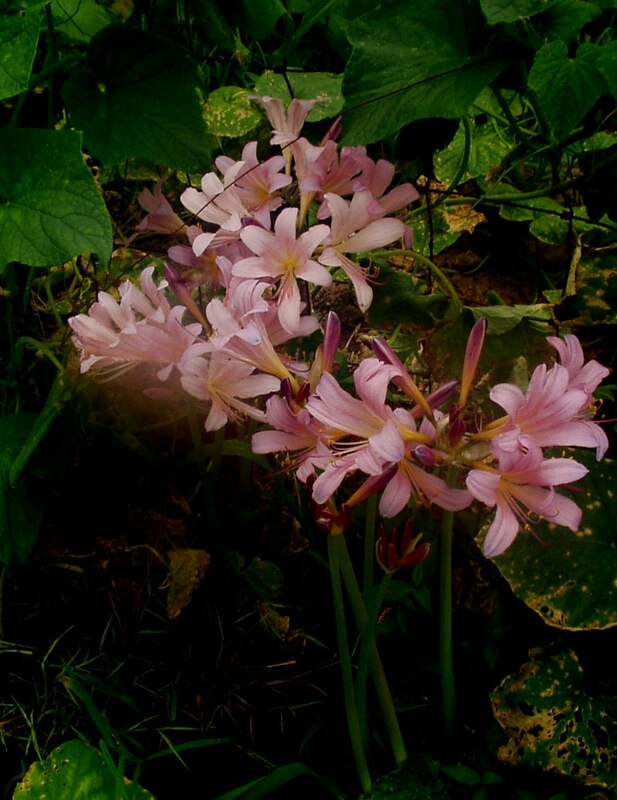 My grandma’s resurrection lilies were blooming at the fence near the clothesline. Every year, they rise from the earth and bloom all in a single day. I was glad they chose today. The email Stated: Congratulations! You are High Bidder. The terms and conditions box was blank. We waited two days to receive an email with instructions from the Seaside Heights, New Jersey Fire Department. Nothing. I turned over to the smell of coffee brewing and could see the light from the kitchen across the hall. I’d taken the day off for a long weekend of travel to pick up our newly purchased boat. I was sure we’d get in some actual boating too. I hadn’t planned to start the trip quite that early though. There is no going back to sleep once Bruce and the coffee are percolating. It was too late to coax him back to bed. I groaned and pulled the covers over my head. “Can you go without me?” I mumbled from under the sheet. He laughed and pulled the covers off me quick, like a band aid. He reached out, pulled me up to a sitting position and put the coffee cup in my hands. I sipped and watched him stuff clothes into his overnight bag. I’d packed my things the night before and put them in the car along with all the stuff from the garage he’d already packed, the toolbox, spare parts, grease gun, shop towels, bungee cords, and other things I didn’t recognize. I wondered why we needed so much stuff just to hook a trailer to the car and head to a water adventure. I shrugged; Bruce always over-prepares. We set our compass on the computer generated directions, skirted the DC traffic at daybreak, and enjoyed the view from the interstate, including Baltimore harbor, the wide Susquehanna, and the Delaware River from the Memorial suspension bridge linking Delaware to New Jersey. As I peered over bridge railings to each body of water below, I imagined us in our boat, cruising along, stretched out in the sun, drinking something cold, and fishing. We don’t leave Virginia often, so we’re used to a slower pace of navigation than what whizzes past north of us. The New Jersey turnpike turned out to be different from what we’re used to. Where we come from, you pay tolls when you enter the highway. We sat confused over the ticket we received at the toll booth. We couldn’t find an attendant to ask what to do with it. We looked around for cops. I peeled out and checked in the rearview mirror every few seconds, listened for a screaming siren behind me, expecting to be hauled off to some jail in New Jersey for going Bonnie and Clyde onto the toll road. We pulled into Seaside Heights under heavy fog. It’s a small coastal town with cottages, ice cream parlors, a boardwalk, and sixties era motels with names like Sea Breeze, The Neptune, and Cloud 9 Inn. We smelled the salt in the air and the wind came from the east off the Atlantic. For late June, the place looked deserted. I glanced at my watch and realized it was still too early in the morning for vacationers to be up and about. Finding the firehouse was easy. It butted up against the police station, and public works department on Sherman Avenue. A big statue of a Dalmatian guarded the two bay doors and the large American flag was snapping overhead in the wind. The fire chief would certainly be in his office by 8:45 a.m. Bruce walked up the steps and rang the doorbell. No one answered. I shrugged and suggested we try the police department. We walked from the street into a small hallway with a door at the end. Bruce tried to turn the knob, but the door was locked. There were two windows, one on each wall at eye level. The girl behind the one on the right sat at her desk doing paperwork. She looked up. “We’re looking for the Fire Chief,” Bruce said. We peered into the thick glass window across the hall. In our town, you walk right into the police department, shake hands with the man on duty and fix yourself a cup of coffee. Here, people milled about on the other side of the glass, not paying attention to us. I pressed the doorbell next to the window. Still no one looked up. “Must not work,” Bruce said. “Try knocking on the glass,” I suggested. He knocked on the thick glass, making a heavy dull sound, and still no one looked up. “Do you think the glass is bullet proof?” I asked, excited at the prospect. I hadn’t seen anything bullet proof in my life. “You think they’re deaf?” Bruce clipped out his frustration. About that time, a girl moved into view from a hallway behind the window and Bruce frantically waved his arms to try to capture her attention. She looked up, surprise on her face and came across the floor to us to ask what we needed over an intercom. Bruce explained about the boat. We stood for awhile and waited. Bruce kept looking at his watch, then up at the window. Finally, he went outside to smoke a cigarette and I walked to the car for some ibuprofen. The turn of events had upped my stress level. I had expected to pull right up to the boat at the fire station, endure Bruce’s usual inspection of the equipment, hook to the trailer and head to the water. I hadn’t expected to wait. I was leaning against the car, taking deep cleansing breaths of ocean breeze, when an older gentleman wearing a white helmet whizzed past me on a red moped. He stopped in front of Bruce who was leaning over the rail outside the police office. “You here about the boat?” The man on the Moped asked. “Yeah, are you the Chief?” Bruce answered. He waited for us to get in the car and pull out behind him. 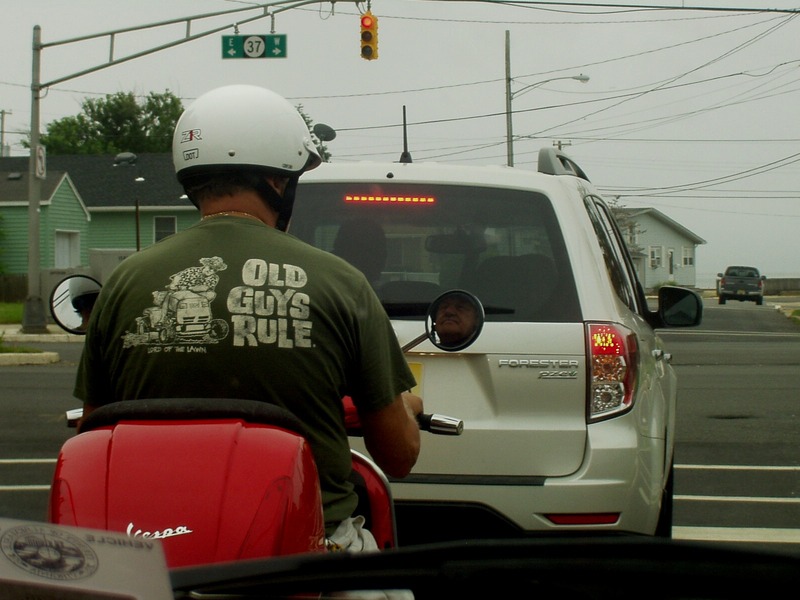 At the first stop light, I read “Old Guys Rule” on the back of his t-shirt. Bruce and I looked at each other, smiled and shrugged. Now I really did feel like Bonnie and Clyde. Bruce would inspect, give the signal, jump into the car and I’d be the get-away driver. I hate conflict and confrontation. I’m lost without a GPS, and with my luck, we’d end up right back at the Police station where we’d be arrested for non-payment. No one we know would make the trip to New Jersey to bail us out of the brig. I prayed for an intact hull, and decent wheels with no rust on the trailer. We crossed the bridge to Pelican Island and turned right into a neighborhood with neat yards and bay views. A couple left turns later, I spotted the boat from the auction website photos. Its bright, spring green hull screamed “Far Out”, and suddenly I wanted to don bell bottoms, a peasant shirt and let my long straight hair loose again. My index and middle fingers raised to form a peace symbol. The “Old Guy” on the Moped, whose name coincidentally happened to be Guy, introduced himself as the treasurer of the fire department. My husband shook his hand, but didn’t stick around for pleasantries. He left the two of us standing in the street while he inspected the boat, motor and trailer. Bruce is never so easily convinced and doesn’t take anybody’s word for condition. Guy finally got tired of watching Bruce pull aside carpet, poke around the dash, flip levers, and fiddle with the engine. He perched on the seat of his moped and gave me the skinny on the boat. “Fella who donated it never did bring us the title to it. I’ve got his name, address, phone number and last registration for the boat and the trailer. He kept promising to bring the titles by the station, but never did. 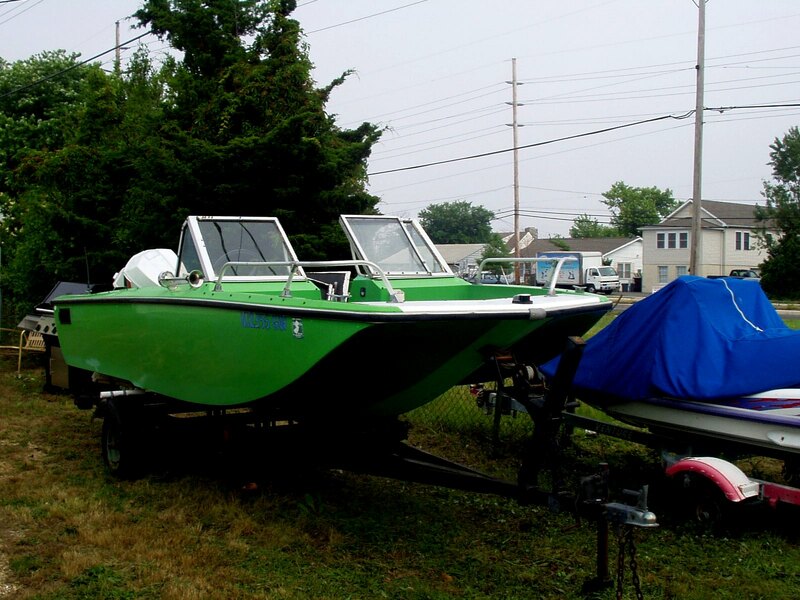 What’s the fire department gonna do with a ’72 tri-hull?” He asked. The tires on the trailer had lost pressure and the boat had been sitting for so long, the tires had sunk into the sand. Bruce kicked the rubber, then bent down and rubbed the sides. “No dry rot,” he said. He picked up the tongue of the trailer and rolled it backward. “Brought my own pump,” Bruce said, extricating the bicycle hand pump from the car. “Whew, you got more stamina than me,” Guy said, watching Bruce pump the handle while the tires inched fatter with air. Both held. Bruce’s look made me think I’d be leaving with a boat. I let out a breath just like the valve stem under the tire gauge. Things were looking up. Bruce reached into his front shirt pocket and handed Guy the cashier’s check for seven hundred fifty-two dollars. We were on our way now. I could feel the rock of the boat on the waves. Guy wrote his phone number on the paperwork and said he’d be at work for awhile, but if we needed anything just to give him a call, he’d help us out anyway he could. He got in his truck and waved goodbye. “Yep, needs work, but nothing I can’t do myself,” Bruce said. “Do you think we can go home via Chincoteague?” I asked. 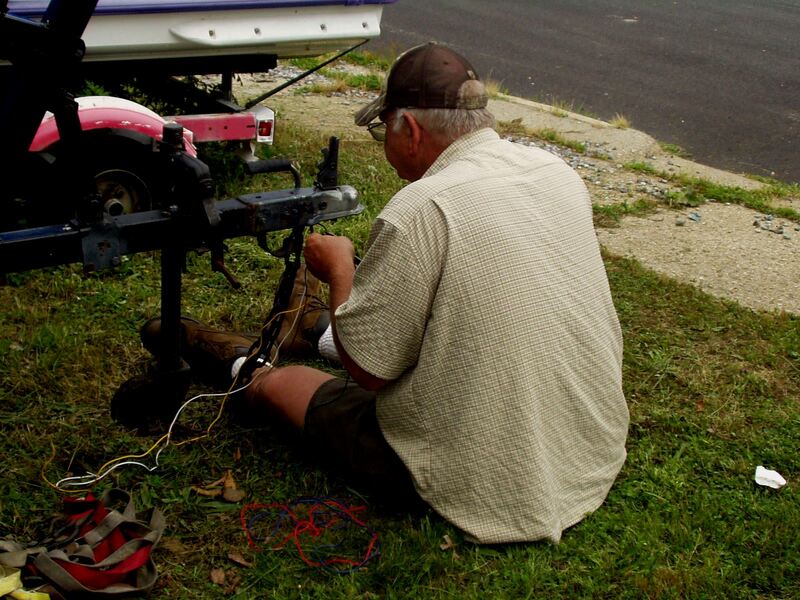 It seemed the trailer had passed Bruce’s initial inspection, but would need its wheel bearings repacked, and its lights re-wired before we could even pull it out of Guy’s driveway. I had a sinking feeling about my weekend float. Friday was waning, we still didn’t have a road worthy boat trailer. Bruce hadn’t even begun to determine the sea worthiness of the boat. “Let’s get to work,” Bruce said, lifting the tool box from the car. I followed him to the tongue of the trailer where bare wires awaited his attention. “Aye, aye Skipper,” I said.